Looking for dentists in St. John’s Wood? Aura dental are taking on new patients all the time and would love to hear from you! We are a highly skilled dental centre based in St. John’s Wood and have dentists to suit everyone! How often you need to see your dentists in St. John’s Wood really depends on the current health of your teeth and gums. An average recommendation is that your visit your dentist at least once a year in order to have a check-up and possibly a clean if needed. For people whose dental health isn’t as good as it could be, a dentist may require you to visit more frequently, say every six or every three months. 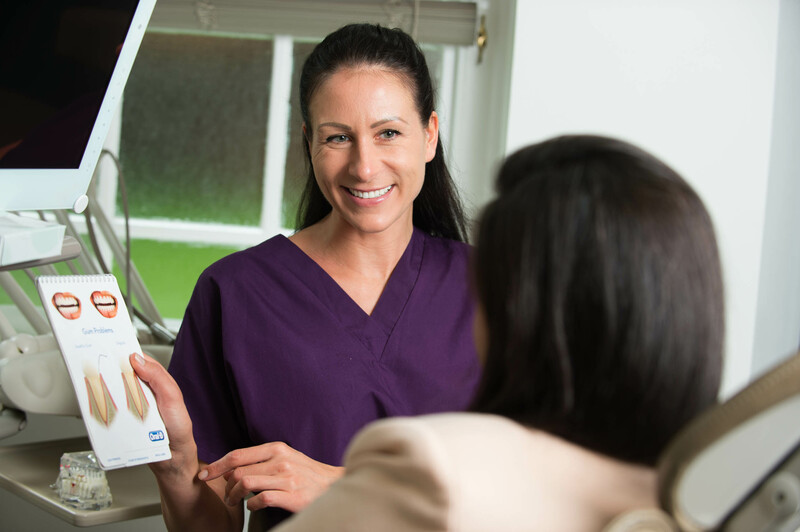 When you have a dentist in St. John’s Wood they will be able to examine you and advise on how frequently you will need to visit them. Children under the age of 18 will need to be seen at least once a year, as their teeth, gums and jaw continue to grow over time, and dentists will want to make sure that they are growing in the correct way. Ask you about your general health and any problems you’ve had with your teeth, mouth or gums since your last visit. Ask you about your diet and give you advice on your diet, smoking and alcohol use, and teeth-cleaning habits. Discuss any treatment you may need and arrange a date for your next visit. A check-up is your opportunity to talk to your dentist about anything you have been concerned about, perhaps bleeding gums or pain in a tooth, and it will allow them to take a better look at those problem areas to check that everything is okay. So don’t leave it too long before you visit your dentists in St. John’s Wood. Contact Aura Dental today to make an appointment with one of our dentists, or for more information on any of the services we offer. This entry was posted in Gum Health on 2nd November, 2016 by Aura Dental. Periodontal disease can happen to anyone, but diabetics are at greater risk of the same. Although most people are unaware that gum problems are a complication of diabetes, such cases are common. In fact, statistics show that 1 in 3 diabetic patients would likely suffer from gum disease at some point over the course of their struggle with diabetes. There are many ways diabetes increases the risk for gum disease. The primary contributing factor, however, is poor blood sugar control. Diabetics have increased amounts of glycated proteins or lipids in the body, which are the very elements that compromise periodontal health. Although the exact link is still unknown to science, health practitioners have many theories. The first one is that glycated substances severely affect the body’s defence against foreign elements, like bacteria. As diabetes weakens the immune system, patient then face heightened risk for infections and eventually, periodontal disease. The second theory is that heightened levels of glycated substances increase inflammatory response in the location of infection, which in this case is the gums and surrounding tissues. Another possible link between diabetes and gum disease is the thickening of blood vessels. Blood vessels are responsible for carrying oxygen and nutrients to different parts of the body and transporting waste products away from these tissues. As diabetes causes blood vessels to thicken, proper flow of nutrients and removal of harmful toxins gets compromised. This again contributes to a weaker resistance against gum and bone tissue infection. Diabetics with poorly controlled blood glucose levels are more susceptible to serious gum diseases and tooth loss. Prevention, however, is possible. The most important step is to control blood sugar levels and maintain good oral hygiene. Brush your teeth after eating, but not immediately after, because brushing too soon may damage the enamel. Use a toothbrush that has soft bristles and avoid applying excessive force when cleaning teeth. Make sure to visit your dentist regularly as well; inform them about changes in your condition and about any medication you are taking. With this, experts will be able to monitor your oral health more effectively. For more information about periodontal diseases, refer to our blog page or visit our clinic today. Our dental team will be more than happy to attend to your dental needs. This entry was posted in Gum Health on 20th November, 2015 by Aura Dental. The human body is a collection of systems; what happens in one part will affect the others. When you have a problem with your gums and teeth, chances are the rest of your body will mirror its effects. Periodontal conditions can affect the rest of your body in a rather simple fashion. The bacteria found in your mouth may find a way to make it into the bloodstream. The American Academy of Periodontology found that there is a connection between periodontal diseases and cardiovascular conditions. Those suffering from gum diseases have greater odds of suffering from a heart attack. While the relationship between gum disease and dementia is not causation, the bacteria from the mouth can get into bloodstream, reach the brain and worsen the disease. Researchers propose that bacteria causes the death of nerve cells. Periodontitis during pregnancy increases a woman’s odds of giving birth sooner than expected. Women whose pregnancies are at less than 37 weeks are at risk. If you are expecting, we advise you to have your gums checked and your pregnancy closely monitored. More often than not, diabetics have gum problems. The reason behind this is the high glucose level in their blood. Bacteria feed on sugar, and this causes them to flourish and become difficult to curb. Things may get worse if you are a heavy smoker or your medication contains some components that may cause high blood pressure. Gum diseases can increase risks of different diseases and complications. If you are concerned about your dental health and the well-being of your body in general, we strongly encourage you to have your gums and teeth regularly checked. Contact us today or visit our other pages to learn more about our dental services. This entry was posted in Gum Health on 6th November, 2015 by Aura Dental. When people think of oral hygiene, they only focus on keeping their teeth white and preventing tooth decay. Gum health is often overlooked and only gets attention when the pink tissue starts to bleed or gets inflamed. Some even ignore gum inflammation, thinking it will get better on its own. If you are one of those people who overlook gum health, you could be at risk of tooth loss, gum disease or breathing complications. Find out more about the other serious repercussions of ignoring gum health. Serious gum disease can lead to bone loss around your teeth, preventing them from becoming unstable. As the disease progresses, it will break down connective gum tissues and destroy bone. In fact, gum or periodontal disease is the most common reason for tooth loss among adults. Progressive and chronic gum disease can affect many pregnant women. If you are carrying a child and suffering from this disease, you are likely to develop gestational diabetes and deliver a premature or low-birth-weight baby. This is why oral hygiene and gum care is more important when you are pregnant. Several studies show that gum inflammation can raise your risk of stroke and heart disease. This is because gum disease increases the inflammation throughout the body, which can lead to cardiovascular problems. You are also almost twice as likely to have coronary artery disease. When you have periodontal disease, you are more likely to inhale germs that can result in lung infections. This is because of the excessive bacteria breeding in your mouth. If you have pre-existing lung problem like chronic pulmonary disease, gum disease may also make it worse. When you have diabetes, you are at more risk of developing periodontal problems. Gum disease will also make it hard for you to control diabetes. It is alarming for severe conditions, as it can put you at increased risk for diabetic complications. Fortunately, getting the gum disease under control can also help control diabetes. Don’t let gum disease compromise your oral health and overall health. Follow a good oral hygiene routine and be sure to schedule regular dental check-ups. Browse through website today and find out how we can help keep your oral health in its prime condition. This entry was posted in Gum Health on 4th November, 2015 by Aura Dental.